24 January 2019 (Toronto, ON) – Country music star CHAD BROWNLEE, platinum-selling recording artist Lauren Jauregui, and the Stanford Band have joined the entertainment lineup for the 2019 Honda NHL® All-Star Game, the National Hockey League (NHL) announced today. The mid-season showcase of the top stars in the NHL will broadcast live from SAP Center in San Jose, Calif., on Saturday, Jan. 26, at 5 p.m. PT / 8 p.m. ET on NBC in the U.S. and on Sportsnet, CBC and TVA Sports in Canada. Brownlee and Jauregui will perform the Canadian and U.S. National Anthems, respectively. Alexis Bravo, a junior student at California School for the Deaf, will sign in American Sign Language both the U.S. and Canadian National Anthems. The Stanford Band will give a special performance during the game. As previously announced, GRAMMY Award-winning artist Bebe Rexha will headline the entertainment with a performance in the second intermission presented by Ticketmaster®. Once a Vancouver Canucks draft pick, now a critically acclaimed country music star, Brownlee is marking his return after a brief hiatus and new team behind him. With the signature sound that fans know and love, but with a fresh new flair, Brownlee released his debut single “Dear Drunk Me” in summer of 2018 - radiating a suave maturity with personal evolution, growth and improvement. The track was written by Gordie Sampson, an acclaimed songwriter for artists such as Keith Urban, Carrie Underwood and Blake Shelton. “Dear Drunk Me” quickly topped charts hitting number 2 on the Canadian Country music charts - his first ever Top 5 single. On January 4, Brownlee released his second single “Forever’s Gotta Start Somewhere” and is currently in the process of finishing his major label debut album. The singer-songwriter’s catalog of albums contains a plethora of fan-favorites and radio hits like “Love Me Or Leave Me,” and gold-certified “I Hate You For It” – proving the steady stream of love for Brownlee’s sound and words. Brownlee holds numerous accolades including a highly coveted JUNO nomination for Country Album of the Year, and consecutive Canadian Country Music Association (CCMA®) Award™ nominations for Male Artist of the Year (2012, 2013, 2017, 2018), Fan’s Choice Award (2017, 2018), Album of the Year (2016) amongst many more. With more music coming very soon, stay tuned for updates at www.chadbrownlee.com. The Sharks and city of San Jose are hosts of the 2019 Honda NHL All-Star Weekend, from Jan. 25‑26, including the 2019 SAP NHL All-Star Skills™ on Friday, Jan. 25 (6 p.m. PT / 9 p.m. ET, NBCSN, CBC, SN, TVAS) and the 2019 Honda NHL® All-Star Game on Saturday, Jan. 26 (5 p.m. PT / 8 p.m. ET, NBC, CBC, SN, TVAS). 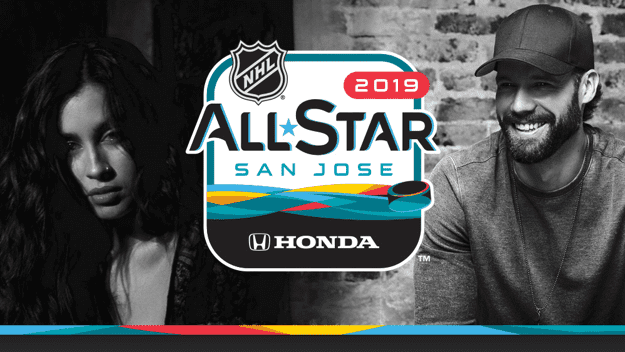 The 2019 Honda NHL® All-Star Weekend marks the second time NHL All-Star activities will take place in San Jose. The Sharks previously hosted the event in 1997. Fans can join the conversation by using the official hashtag #NHLAllStar. For more information on the 2019 Honda NHL® All-Star Weekend, visit NHL.com/Fans/All-Star.